In 2005, celebrating the centenary of American film production, John Williams’ score for George Lucas’ 1977 space opera Star Wars topped The American Film Institute’s list of “the 25 greatest American film scores of all time” (AFI, n.d.). To film music historians, the score had already become more or less synonymous with the beginning of a renaissance of classical symphonic film scoring in US film production in the late 1970s thus lending it an enduring iconic status (e.g. Burlington 2000, 187; Audissino 2014, 77; Cooke 2018, 8). And, arguably, its main title music is still the most popular and best-known piece of symphonic film music ever written. The aim of this article is to zoom in on the most celebrated recording of the Star Wars main title music in order to shed light on its prominent but also surprisingly eventful career within the Star Wars franchise. 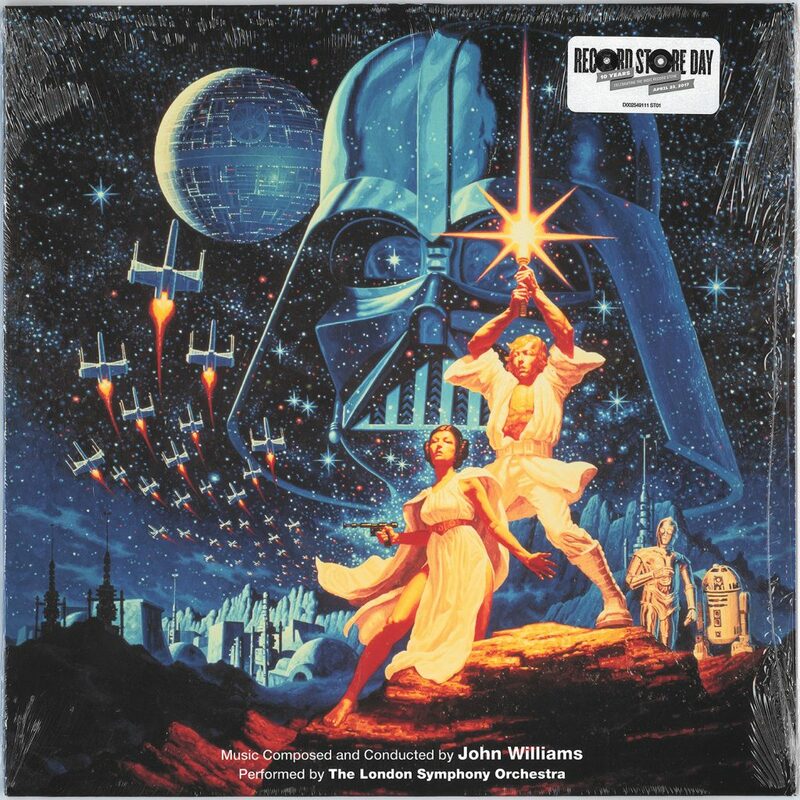 Inscribed with an aura of authenticity not least by fans, this the very first recording was done by the London Symphony Orchestra conducted by composer John Williams at the Star Wars scoring sessions at Anvil Recording Studios in the UK in March 1977 under the helm of recording engineer Eric Tomlinson. These recordings were produced primarily to add dramatic underscoring to the film but also to provide material for a soundtrack album produced by director George Lucas. Cross-promotional strategies using film to sell music and vice versa had for several decades been a stable of the American film and record industries with major film companies even running their own record companies as part of their music division. According to film historian Jeff Smith, the commercial exploitation of this synergy would intensify from the mid-1970s resulting in an increase in and diversification of soundtrack album production (Smith 1997, 189-229). 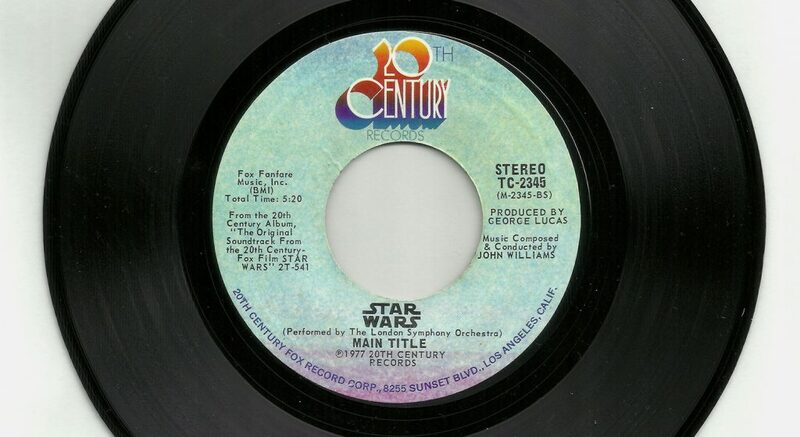 Thus, apart from becoming an indispensable ingredient in the main title sequence of not just the first but all subsequent Star Wars films, the main title music in many different versions would ride the crest of this successful wave of film music record production to gain and sustain its iconic status. The story of the unusual forty-plus-year trajectory of the original main title music recording is one of multiple reshapings and recyclings at the hands of various distributors with primarily commercial interests. If anything, it demonstrates the malleability of recorded material challenging the notion of the fixed phonographic work. In fact, the main title overture was conceived not for the film but only for the soundtrack album. When the record division of the film’s distributor, 20th Century Fox, was persuaded to release Williams’ extensive score in the, at least for film music, unusual format of a 2-LP album, the composer wanted “to give the beginning of the record the feeling of an overture” (Williams quoted in Lippincott 1977). This overture form originated as a self-contained instrumental introduction to operas in the 17th century and remained a common feature until the end of the 19th century. As many theatrical conventions, it was adopted by the Hollywood film industry. Thus, a musical overture played to closed curtains before the screening began and was followed by main title music playing during the film’s opening main title sequence. This screening practice was reserved for select productions often within the genre of prestigious epic film like Gone With the Wind (1939) and Ben-Hur (1959), but by 1977 the practice was no longer common. Williams’ score did not include an overture as Star Wars would not open with one. And so, Williams chose to construct one for the soundtrack album by simply combining two already existing music cues: The main title cue that opens the film and the end title cue that rounds it off. Confusingly, the title of this opening track on the album itself is simply Main Title. But in order to separate the album overture from the main title music cue, it will be referred to as ‘main title overture’, ‘album overture’ or just ‘overture’ henceforth. As the following detailed description of the two cues combined for the overture shows, the cues served different functions in the film and so had quite different characters (fig. 1). Fig. 1: The two-part structure of the main title overture. The colour coding highlights the distribution of the three musical themes: Luke Skywalker (blue), Rebel fanfare (green), Princess Leia (red). The main title cue that makes up the first half of the album overture (cf. fig. 1) begins with a bang, a loud orchestral chord synchronized with the sudden on-screen appearance of the film title (fig. 2). Fig. 2: Film title (00:28). Still timings refer to the film, not the recording. This is immediately followed by a weaving of busy brass fanfares, noticeably similar to Rozsa’s opening music for the adventure film Ivanhoe (1952). The fanfares build to the first statement of the Luke Skywalker theme (0:07-0:26), most commonly known simply as the theme from Star Wars. The conventionally heroic first part of the theme carried by trumpets is characterized by big melodic leaps indicating the active and adventurous character of the male protagonist, Luke Skywalker. The thrilling sense of action is compounded by the varied and off-beat chord punctuations accompanying the theme while a high flying wavering layer of woodwind and violins add the sound of the soughing wind. The piece is off to a flying start. After a repetition of this first part with a more regular march-like accompaniment, the music calms and softens while the contrasting smoother second part of the theme is played by strings (0:26-0:44) only to give way to the return of the heroic first part now carried primarily by horns (0:48-1:09). This whole thematic section has underscored the iconic opening crawl (fig. 3), but as the yellow text disappears into dark space leaving us in an empty though star filled void in outer space, the music also dies down and mirrors the on-screen stasis with a soft shimmering in strings and celesta, an apt musical depiction of twinkling stars (1:24-1:31). Fig. 3: Opening title crawl (00:47). Only a short solo flute motif adds a bit of movement, as if this tiny isolated presence were to underscore the immense vastness before our eyes (fig. 4). Fig. 4: Star filled space (01:48). The very moment a slow downward camera tilt reveals the first of three planets in still closer proximity, the music returns to action mode (1:31): Rushing strings in an upward motion quickly culminates in the introduction of the rebel fanfare (1:38-1:41), a perfectly timed musical announcement of the rebel forces that fly into view immediately after in the form of the Rebel blockade runner of the fleeing Princess Leia (fig. 5), who is being pursued by the “Empire’s sinister agents” in their much larger Star Destroyer spaceship. Fig. 5: The appearance of the Rebel blockade runner (02:05). During the short pursuit before the rebel ship is overtaken, heavily pounding oppressive orchestral chords build (1:42-1:56), unmistakably but aptly inspired by Gustav Holst’s musical depiction of the war planet Mars in the first movement of his orchestral suite The Planets (1914-16), and then give way to a full statement of the rebel fanfare over a militaristic beat (1:56-2:06). In the film the underscoring is almost overpowered by the sound of the fire exchanged between the two ships and the cue comes to an end as it drowns in the sound of an explosion on top of the rebel ship (fig. 6). Fig. 6: Explosion on top of the Rebel blockade runner (02:28). To be able to combine this opening cue with the end title cue, Williams created a musical bridge by revising the beginning of the latter cue. While the opening cue had been recorded on the first day of recording (5 March 1977), the revised end title cue would be the very last cue to be recorded (16 March 1977). The two recordings were then spliced together by lopping off the last measure of the opening cue, where the music came to rest (as used in the film), and segueing it into the new recording (2:06). Whereas the opening cue after the disappearance of the text scrawl primarily served as mood and action underscoring as well as an introduction to the leitmotif of the rebel forces, hence its ‘rhapsodic’ structure, the end title cue simply accompanied the end titles (which in the film follows the majestic underscoring of the throne room scene without a break) and gave the composer the opportunity to showcase his richly thematic score in medley form. Thus, end title sequences which in large film productions may last ten plus minutes generally constitute a perfect platform for promoting tie-in audio products like soundtrack albums or the music of associated artists. Perhaps because of the fact that the force theme had featured prominently in the concluding throne room scene, the end title music is devoted to other key themes: First a full statement of the Luke Skywalker theme (2:13-3:03) suitably contrasted with the calmer and warmer Princes Leia theme carried by low strings but interspersed with a delicate sounding of the rebel fanfare in flutes (3:11-3:49). Finally, a swashbuckling return of the Luke Skywalker theme (3:56-4:26) with a slightly varied second part that builds to a grand conclusion centred on the rebel fanfare (4:27-5:20). From a strictly formal point of view the overall structure of the resulting overture could be considered somewhat unconventional due to the disparate character of the two halves; simply a ‘quick fix’ that forced the musical bookends of the film into a workable unit in order to serve an audio product purpose for which the two cues had not originally been conceived. This strategy of combining single cues into composite album tracks, however, characterizes the whole album as shown in figure 7. Fig. 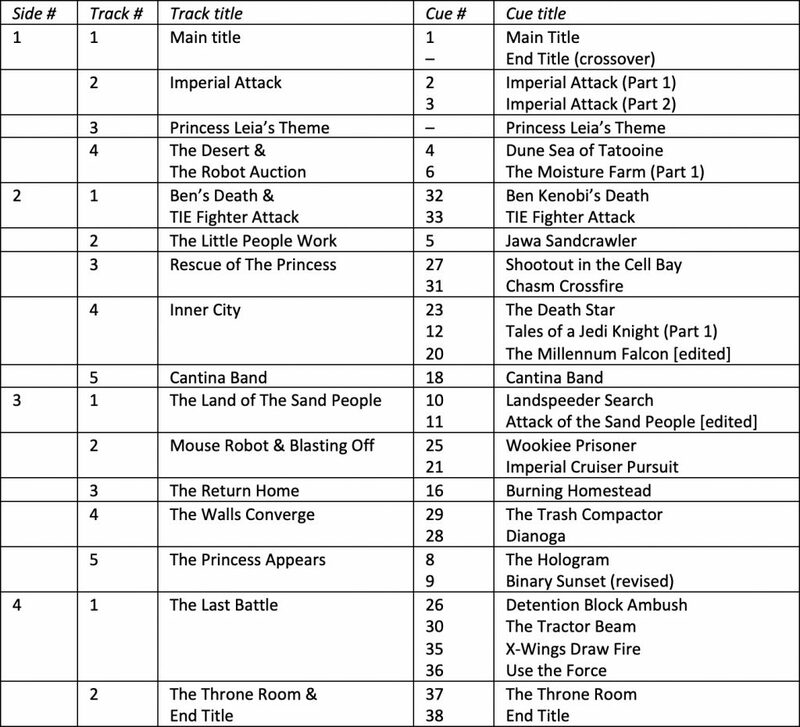 7: Overview of the 1977 Star Wars soundtrack album showing how individual tracks in most cases are constructed from the combination of cue recordings. Cue titles are those of the recording log presented in the booklet of the 1997 soundtrack album. John Williams and remixing engineer John Neal selected 29 cues out of a total of 38 (approximately 80 percent of the whole score) and combined them into 15 tracks, of which only three consisted of single cues, and most tracks were given new titles. Of the four album sides, only the sequencing of tracks on the first and last side more or less reflects the order in which the cues appear in the film. Moulding the recorded film cues into a soundtrack album, the producers clearly tried to create a varied listening experience for each of the four sides and the album as a whole without totally disregarding the narrative structure of the film. The resulting programme can be viewed as an elaborate suite of autonomous pieces. The beginnings of this predominant matrix for commercializing dramatic underscoring as soundtrack album can be traced back to the early 1940s (Burlingame 2000, 3-6). But only with the advent of the long playing (LP) format in 1948 and the first release of original soundtrack recordings of underscoring in 1949 (from MGM’s Madame Bovary) did the classic tie-in suite-based film score album begin its rise. However, the edited or re-shaped music cues would usually be re-recorded specifically for album release, wherefore the use of the ‘(original) soundtrack recording’ tack was, strictly speaking, often a misnomer (Nielsen 2007, 62). Although the Star Wars album constitutes a ‘genuine’ soundtrack album, the programme does include an additional recording meant only for the album but recorded as part of the scoring sessions, namely a concert arrangement of Princess Leia’s theme (side 1, track 3). This anomaly, in Williams’s own words “a straight-forward musical presentation of the theme” (Williams quoted in Lippincott 1977), simply serves as highlighting of a key musical theme. From the extensive album programme Williams would also distil a shorter symphonic suite to be played in the concert hall made up of a sequence of seven movements: Main Title, The Little People, TIE Fighter Attack (retitled Here They Come), Princess Leia’s Theme, The Cantina Band, The Last Battle (renamed The Battle), and The Throne Room & End Title. Selections from this concert suite were premiered at the Hollywood Bowl in Los Angeles on 20 November 1977 by the Los Angeles Philharmonic conducted by Zubin Mehta and first recorded by the same forces in December 1977 (London Records, ZM 1001). And an almost concurrent British recording by The National Philharmonic Orchestra conducted by Charles Gerhardt was issued by RCA Victor (RCA Red Seal, ARL1-2698). These albums based on re-recordings are not unlike the historical film score albums mentioned above, and John Williams would himself record similar suite extracts with the Boston Pops Orchestra in 1980 (Philips, 9500 921) and with the Skywalker Symphony Orchestra in 1990 (Sony Classical, SK 45947), both including the Star Wars overture. The original soundtrack album was released concurrently with the film, which premiered in the US on 25 May 1977. The album entered the Billboard album charts (at the time titled Top LPs & Tape) on 18 June and would peak at the number 2 position for three consecutive weeks from 10 September, a truly impressive achievement for an album of symphonic instrumental music. By then the album had already been certified Platinum by the Recording Industry Association of America® (RIAA) on 17 August for the sales of 1 million copies. As a token of its immense success John Williams would win 3 Grammy Awards in 1978 for his Star Wars score, including Best Album Of Original Score Written For A Motion Picture Or Television Special, and Best Instrumental Composition specifically for the main title music. The album was also nominated for the most prestigious award, Album of the Year, but lost to Rumours by Fleetwood Mac. Over the next year, the film would premiere over most of the world often followed by regional releases of the soundtrack album. While the music programmes on all of these album releases were identical, parallel releases of the main title overture in the 7″ vinyl single format resulted in no less than three additional edits of the very same recording in different territories. Part of the early commercial success of the Star Wars music must be credited to the 7″ vinyl single released concurrently with the album. It entered the Billboard singles chart Hot 100 on 9 June and peaked at the number 10 position on 17 September for a single week, while the album was also peaking. The musical programme of the single consisted of two tracks from the soundtrack album: Main Title on one side and on the other, Cantina Band, a Benny Goodman-inspired piece of wacky swing music including steele drums. This was one of two pieces of source music written for the band in Chalmun’s Cantina at the spaceport of Mos Eisley and played when Luke Skywalker enters the cantina with the android C-3PO. The very first US pressing of this single (20th Century Records, TC-2345), a promotional copy not for sale but distributed to radio stations in a generic paper sleeve (fig. 8), does not have an explicit side designation apart from the two consecutive matrix numbers (M-2345-AS and M-2345-BS), which indicates that Cantina Band (M-2345-AS) was the intended A side. This makes sense as the duration of this piece (2’44”) was better suited to the radio format compared to the Main Title, which ran for approximately 5’20”. Also, its more popular music style might appeal to a broader radio listenership. Fig. 8: Promotional Copy of the first US Main Title 7″ release. Notice the lower matrix number for Cantina Band side. The editing of the original track (fig. 9) is surprisingly amateurish and can hardly have been sanctioned by John Williams: The first edit (at 0:07) segues the three short upbeat notes that kick off the Luke Skywalker theme at the end of the opening fanfares into the second statement of the same theme (in the original track at 0:48). As the music is metrically, tempo-wise and harmonically unaltered, the edit might have worked. But, inexplicably, the editor cuts to the middle of the first long theme note leaving out half a measure of music. This not only alters the melodic structure of the theme but also ruins the four beat metric structure. Basically speaking, there is an odd jerk in the flow of the music. But the second edit (at 0:49) even tops this: Here the editor cuts directly from the end of the short flute motif heard during the quiet section of twinkling stars (in the original track 1:24-1:31) to the return of the Luke Skywalker theme at the beginning of the second half of the original track. What makes this edit musically even more problematic is the decision to leave out the first two of the three short upbeat notes and cut directly to the last note, which, instead of being heard as the last unstressed upbeat to the strong downbeat of the first long theme note is actually heard as a strong orchestral downbeat that marks the beginning of a new measure affecting the experience of the subsequent music. Again, the result is the unintended listening experience of momentarily losing one’s metrical footing. The third and last edit (at 1:39) segues the end of the Luke Skywalker theme into the middle of the concluding rebel fanfares (in the original track a cut from 3:03 to 4:37) and works fairly well despite a sudden shift in instrumentation and key plus an increase in tempo. The overall impression is that of an incompetent and musically insensitive editor unfamiliar with this kind of music. However, promotion-wise, this short version achieves a highlighting of the main theme by relegating the rebel fanfare to the end of the piece while leaving out Princess Leia’s theme altogether. Figure 9. The three ‘boxed’ cuts in the edited 2’20” version of the Main Title 7″ single. Replacing the first single version in the US, this musically mangled version would be the only single version distributed in the UK, Spain, Portugal, Japan and Australia. Almost everywhere, Main Title was explicitly designated as side A, either on the label or the sleeve, only adding to the exposure of the overture around the world. In early 1978, this single version was reissued in the US (20th Century-Fox Records, TC-2345) with a redesigned label that reflected the recent slight change in company name from 20th Century Records to 20th Century-Fox Records. While the Main Title single had been issued in a variety of picture sleeves in various territories, this was the first US picture sleeve release (fig. 10). Fig. 10: A selection of Main Title 7″ picture sleeves. 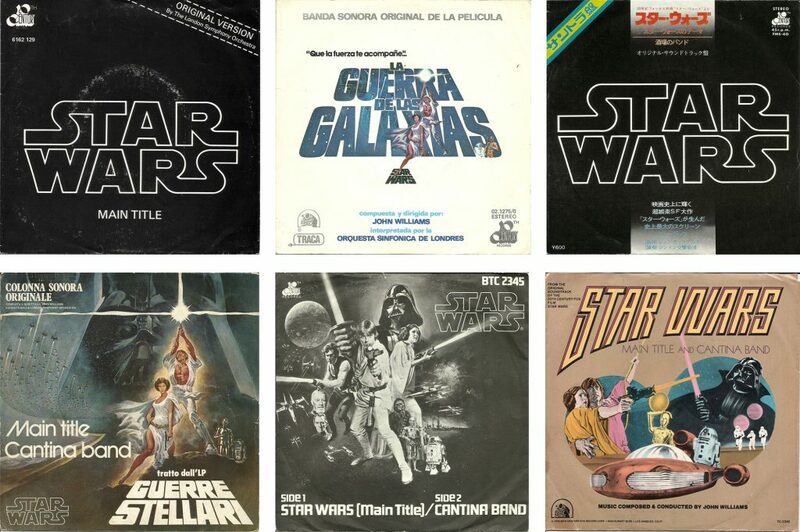 From left to right and top to bottom: Holland (1977), Spain (1977), Japan (1977), Italy (1977), UK (1977), and US re-release (1978). In Europe, two territories came up with alternative solutions to creating a shorter single version of the album overture. The editor of the French 7″ single (20th-Century Records, SG 651) simply opted for a fade out in the original track at 2:56-3:04 which had the music trail off at the end of the complete statement of the Luke Skywalker theme at the beginning of the second part of the overture. The use of fading has, of course, been a conventional feature in pop and rock since the 1960s, perhaps most commonly associated with the pop song which typically ends with fading repeated choruses. Regarding single releases of tracks derived from pop albums, this option is often chosen as a simple way to shorten album tracks so that they better fit the radio format. It also allows the radio host to begin talking during the fade out making for a smooth transition, and so may even have originated with the DJ’s cross-fading practice. However, in recordings of classical music and traditional symphonic film scores, the use of fading is an anomaly. And although well-timed in this specific instance, the use of this unconventional editing option brings the listening experience to an unexpected anti-climactic conclusion with the main title theme trailing off into space as it were. Again, one cannot help wondering whether the editor was operating in unknown musical territory. The Dutch 7″ single (20th-Century Records, 6162 129) is again shortened by cuts, but, unlike the short US version, this is achieved with only two very different and more professional cuts (fig. 11) that are both metrically and harmonically unproblematic: The first simply eliminates the return of the first part of the Luke Skywalker theme after the calmer middle-section (in the original recording 0:49-1:10), which results in the build up to the return of the main theme culminating in another build up, this time to the entrance of the rebel fanfare – a slightly unusual dynamic. The second cut simply skips most of the second part of the overture and segues the first part into the second part at a point (in the original at 3:53) that is musically almost identical to the beginning of the second part, i.e. the original segue point, both leading to a statement of the Luke Skywalker theme. Again, the main casualty is Princess Leia’s theme, which was removed from all three short versions, while the rebel fanfare is given a more prominent place compared to the short US version. Fig. 11: The two ‘boxed’ cuts in Dutch version of the Main Title 7″ single, and the addition of the Fox fanfare. However, the most striking and also unique feature of the Dutch single version is its beginning, where five seconds of film composer Alfred Newman’s 1933 20th Century Fox Fanfare has been added. Fig. 12: The 20th Century Fox logo (00:05). This additional music is credited separately on the label and its use recalls the beginning of the film experience itself. On screen, the fanfare in its 1953 Cinemascope extended version accompanies the 20th Century Fox logo (fig. 12) while the extended ending coincides with the green LucasFilm logo (fig. 13). Fig. 13: Lucas film credit (00.11). Then silence as the blue text of “A long time ago in a galaxy far, far away…” appears (fig. 14). Fig. 14: Film title text before film title (00:21). And only then the film title with Williams’ music explodes onto the screen. The 20th Century Fox logo and fanfare was no longer in common use by 1977, but apparently Lucas insisted on its appearance, which no doubt signalled ‘good old-fashioned entertainment’ to many filmgoers. From an audio and musical point of view, the contrast between the ‘historical’ sound of the 1954 recording used for the Newman fanfare and the state-of-the-art Dolby sound of the film itself beginning with the massive orchestral chord of the main title cue after a few seconds of silence is stunning. Written in the same key, Williams’ opening fanfares can almost be heard as an extension of Newman’s fanfare and thus link the Star Wars score to the golden era of symphonic film music, which it was referencing, as Audissino has pointed out (Audissino 2014, 74). The carefully constructed Dutch single offers an audio recreation of this effect: The extract from an old mono recording of the Newman fanfare segues directly into Williams’ opening chord in a state-of-the-art stereo recording. The explosive expansion of the music literally reveals a much larger sound stage, almost an equivalent of the unending on-screen space behind the film title. This combination of fanfare and main title music was repeated on a 1978 compilation LP titled The Spectacular World of Classic Film Scores – 20 Highlights From the Best-Selling RCA Series (RCA, ARL1-2792). It promoted US conductor Charles Gerhardt’s series of themed LPs with re-recorded excerpts of classic symphonic film scores begun in 1972. The series both reflected and played a leading role in awakening interest in Hollywood’s musical legacy that would lead to the renaissance represented by John Williams’s Star War scores. The first edition of this compilation LP had appeared the year before Star Wars in 1976 titled The Spectacular World of Classic Film Scores – 19 Highlights From the Best Selling RCA Series (RCA, RL 42005). Here the opening track of no less than five classic film company fanfares ended with the 20th Century Fox Fanfare followed (inconsequentially) by Korngold’s main title music to the 1935 Warner Brothers swashbuckler Captain Blood. The addition of the Star Wars overture to the 1978 re-release among a selection of ‘golden age’ symphonic film music was an unmistakable recognition of Williams’ contribution to this renaissance, and the placing of the new track immediately after the film fanfares was no doubt a conscious attempt at recreating the film experience. And, finally, when all three Star Wars soundtrack albums from the first trilogy were re-released in a boxed CD set (20th Century Fox Film Scores, 07822-11012-2) in 1993, the inclusion of the opening fanfare on each soundtrack amounted to an official canonization of this musical symbiosis, which remained intact on all additional CD re-releases until 2018. However, the album status of the overture itself was about to change. While the various vinyl single deconstructions of this seminal Star Wars recording served primarily commercial ends basically treating the overture as a piece of pop music, what the overture fell victim to next was driven by a shift in soundtrack album aesthetics. Although the opening tracks of the two following Star Wars soundtrack albums, The Empire Strikes Back (1980) and Return of the Jedi (1983), would be main title music, it would not be in the form of a self-contained overture. The main title music playing during the title crawls would remain essentially the same as in the original film but as the cues changed into action-based underscoring after the full statement of the Luke Skywalker theme, they would go in new directions and not segue into end title music. Thus, the already iconic overture of the first album would remain the only choice for a stand-alone original soundtrack version of the Luke Skywalker theme. The continued popularity and representational role of this recording can be gleaned from the fact alone that when PolyGram, a major multi-national entertainment company, put together a demonstration disc programme in 1983 for the launch of the new compact disc format, titled Sampler U.S.A. Popular Repertoire (PolyGram, 811 337-2), the full 1977 overture track was included among a diverse repertoire of contemporary American, British and Canadian popular music – a very unusual context for a piece of symphonic film music were it not for its status in popular culture. In the same year, the original Star Wars soundtrack album as a whole was among the earliest CD releases (RSO, 800 096-2 Y H2). The four LP sides had been distributed onto two CDs preserving the original musical programme and track sequence. Ten years later, in 1993, all three soundtrack albums were released in a boxed set containing four CDs, titled Star Wars Trilogy – The Original Soundtrack Anthology (Twentieth Century Fox Film Scores, 07822-11012-2). As already mentioned, each soundtrack album now began with the 20th Century Fox Fanfare but, more importantly, the tracks had been “resequenced to reflect more of a chronological order” (Kendall 1993). Still, apart from a slight expansion of two tracks plus the relocation of Cantina Band to CD four in order to contain the whole album on a single CD, the musical contents of the original Star Wars album, including its overture, remained intact. However, CD four, which consisted primarily of previously unreleased music from all three trilogy films, would offer an alternative album opening where the film fanfare was followed not by the overture but by the main title cue. Until this release, the main title cue had been commercially available only as printed music, a short score being included in the “deluxe souvenir folio of music selections” published in 1977 by the Twentieth Century-Fox Film Corporation (P0214VSA). Now, for the first time apart from the film, fans could hear this music end on a dying chord instead of segueing into the end title music. Only four years later, in 1997, another set of Star Wars soundtrack albums hit the market as part of the heavily hyped release of the updated special edition versions of the Star Wars film trilogy. In the initial limited edition each of the three albums came with a lavish hardback booklet housed in a slipcase and shining holographic printing on the CDs. According to Smith, the new distributor RCA Victor Records spared no costs to optimize sales: “To generate interest in the rereleased soundtracks, RCA mounted a $1 million promotional campaign, which included television spots on several science fiction shows, such as The X-Files and Dark Skies. […] With advance orders of more than 100,000 units, it surprised no one when the first of these deluxe collector’s editions leapt onto Billboard’s Top Twenty” (Smith 1998, 217). The popular appeal of Williams’s scores was obviously still intact. […] the Academy Award winning score for Star Wars is now presented complete and uncut. For the first time, all music follows the chronology of the film, including previously unreleased material and a recently located alternate cue. This sequencing has necessitated the creation of new track titles which have been designed to accurately reflect on-screen story action as well as provide terminology specific to the Star Wars universe. Hearing the complete score for Star Wars in the sequence of the film adds a unique, organic dimension to the listening experience. Very few scores so vividly paint musical pictures of such accessibility and precision that one becomes aware of the narrative through the music alone. In any given moment there is no mistaking desert for detention block or spaceport for sand-crawler. The plight of Princess Leia, the coming-of-age odyssey of Luke Skywalker, and the final quest of Obi-Wan Kenobi all exist as much in the music as they do on the screen. John Williams weaves these various characters and storylines into a unified musical whole through his use of specific moods and distinct thematic material. Here Matessino invokes both romantic organicism and the notion of programmatic music, key aesthetics within traditional art music, in his rather speculative defense of the revised programming; by claiming a structural unity to what might as well be viewed simply as a chronological collection of music cues, this new remediation was presented as true to the nature and intention of the score. 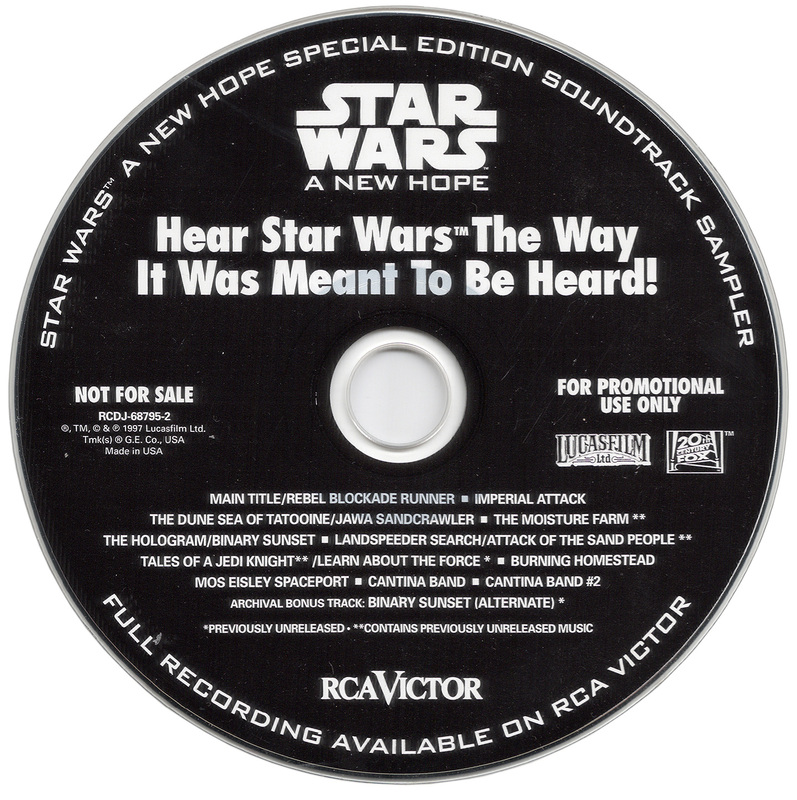 “Hear Star Wars The Way It Was Meant To Be Heard!” as the CD sampler promoting the revised album proclaimed (fig. 15). Fig. 15: Promotional CD sampler tooting the accomplishment of the 1997 soundtrack album. The main victim of this soundtrack album concept is Williams’s original album opening, the main title overture. Although Matessino does not address explicitly the ‘necessary’ loss of this key piece of Star Wars music in his otherwise detailed booklet essay, it is obvious that what was originally created specifically for the soundtrack album presentation of the score, is now at odds with a new overriding sequential logic. (And yet, the scoring sessions recording of the stand-alone arrangement of Princess Leia’s theme is, illogically, included and placed as the opening track on CD 2 breaking the sequential order.) The overture is unceremoniously replaced by the main title cue retitled Main Title/Rebel Blockade Runner. And as if to hammer home the new status of the main title cue, all five takes originally recorded are included as a hidden track at the end of CD 1. (Both the main title cue and the end title cue were recorded five times, takes 16-20 and 215-219 respectively, which produced a wealth of recorded material from which to forge the two halves of the overture. The potentially different takes used for the 1993 CD albums has resulted in much debate among fans, cf. Malone 2012, 20-21.) The tie-in CD single (BMG, 09026-68973-2) to the new soundtrack album dispensed with main title music altogether, containing only Cantina Band music, perhaps because the main title cue does not work particularly well as a stand-alone track. As a precursor to the suppression of the main title overture, the 1996 compilation album Billboard Top Movie Hits 1970s (Rhino, R2 72424) released by Rhino Records in collaboration with well-renowned chart researcher Joel Whitburn, opened with the main title cue, licensed from LucasFilm. It was misguidingly titled ‘Star Wars (Main title) (Album Version)’, and the chart information in the liner notes actually referred to the single version. Ironically, the main title music in this form had, of course, never appeared on the charts. As musica non grata the most iconic recording of Star Wars music would now disappear altogether from all officially released Star Wars soundtrack albums for almost twenty year. Between 1997 and 2016, the completist soundtrack albums of the original trilogy would be re-released by Sony Classical no less than three times in the US alone (2004, 2007 and 2016), each time in new packaging and with varying titles thus keeping the ever-popular music of the original trilogy on the market. The two latter releases were bundled with the three soundtrack albums of the new prequel trilogy produced between 1999 and 2005 and the CDs were housed in mini-replicas of the original LP jackets although their track listings did not, of course, correspond to the actual musical contents on the CDs. However, due to the recent comeback of the vinyl LP as a mainstream format, the 2016 CD re-release concurred with a corresponding LP box set titled Star Wars: The Ultimate Vinyl Collection (Sony Classical, 88875087451), in which the soundtracks of the original trilogy were not only housed in replicas of the original LP jackets but also constituted the first re-release of the original soundtrack albums in the 21th century. Whether dictated by vinyl nostalgia or format limitations, the reappearance of the 1977 soundtrack album also meant the official return of the main title overture. Even the original vinyl single with the full unedited overture made a sort of a reappearance as LucasFilm produced 150 hand-numbered copies with a unique cover (fig. 16) as a promotional gimmick, adding an instant collector’s item to a global franchise with an already extensive collector’s market. Fig. 16: The sleeve of the promotional 7″ Main Title single produced by LucasFilm in 2016 in only 150 hand-numbered copies. But the restoration of the overture as part of the vinyl renaissance was most prominently celebrated with the exclusive Record Store Day release by Walt Disney Records of the main title overture on a 10″ single with classic art work on 22 April 2017 (cf. fig. 17). 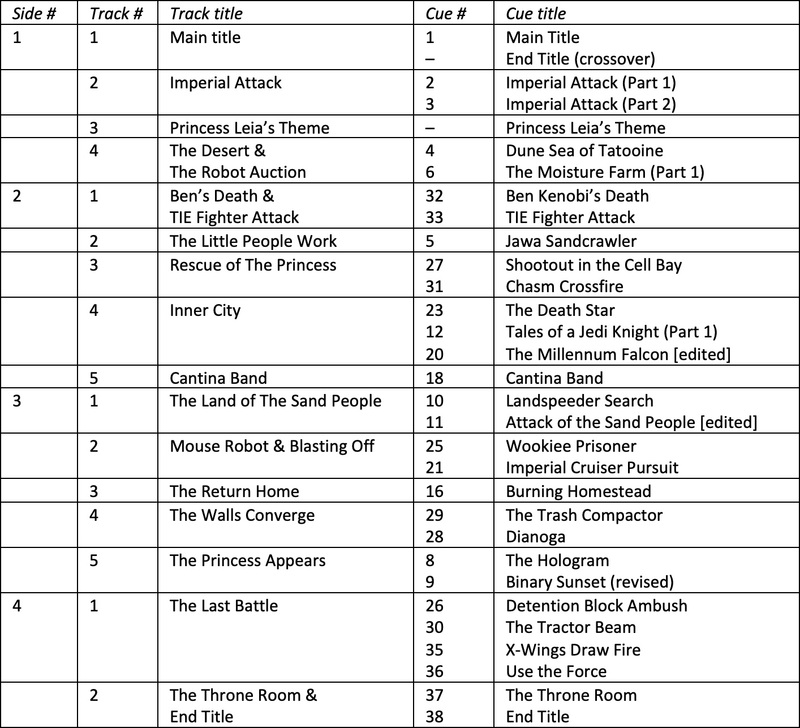 The B-side, however, was given to the last track on the original album, The Throne Room and End Title, not Cantina Band. Forty years on, the most iconic Star Wars recording was finally back in business, at least among record collectors. And finally, in May 2018, the original soundtrack album even made a comeback in the waning CD format (Walt Disney Records, 050087364229) although, anachronistically, retaining the film subtitle ‘A New Hope’ added in 1997. Fig. 17: Sleeve with Record Store Day 2017 sticker of Main Title 10″ release on Walt Disney Records. These official releases pose a challenge to the canonical status of the completist 1997 album and can perhaps best be viewed as an extension of a prevalent retro turn in popular music aesthetics into the soundtrack album market and consumer culture. If the return of the album overture signals a happy ending to fans of the original album, it also meant a goodbye to the longstanding symbiosis of film logo fanfare and main title music. Lucas had continued to use the logo and fanfare of Twentieth Century Fox in all six Star Wars films of the two first trilogies, and many fans came to consider it a part of the film itself. But with Disney’s purchase of LucasFilm in 2012, this came to an end and fans have voiced concern over the current distributor’s likely removal of the former distributor’s logo and fanfare in future releases of the early Star Wars films. For more than 40 years multiple acts of reconception by succeeding distributors with various intent have shaped the career of the original recording of the Star Wars main title overture, itself only one in a large number of recorded versions. While its sustained popularity and the sheer number of released edits is unusual, commercial and artistic editing of recorded material is, of course, common practice within the record industry. Crossing over into a mainstream music market usually reserved for popular music, the recording quickly escaped the artistic control of its creator to be subjected to radio format editing associated primarily with pop songs and thus became a more flexible promotional tool in territories around the world. In the short era of the CD, it ran foul of a new aesthetic in soundtrack album production that claimed to serve original artistic intention by reproducing the filmic running order of music cues on the soundtrack album. And most recently the album overture has been restored in the re-release of the original album on vinyl and, subsequently, various digital formats. Thus, the recording has served many masters in various guises as a small but key element in a very successful franchise. No doubt, its repeated reshapings and recyclings has contributed to making this iconic recording a fixture in the core repertoire of symphonic film music. American Film Institute (n.d.): “AFI’s 100 Years of Film Scores”. Accessed 22-10-18. Audissino, Emilio (2014): John Williams’s Film Music. Madison: The University of Wisconsin Press. Audissino, Emilio, red. (2018): John Williams. Music for Film, Television and the Concert Stage. Turnhout: Brepols. Burlingame, Jon (2000): Sound And Vision. 60 Years of Motion Picture Soundtracks. New York: Billboard Books. Cooke, Mervyn (2018): “A New Symphonism for a New Hollywood: The Musical Language of John Williams’s Film Scores.” In John Williams. Music for Film, Television and the Concert Stage, edited by Emilio Audissino. Turnhout: Brepols. Jenkins, Garry (1998): Empire Building. The Remarkable Real Life Story of Star Wars. London: Simon & Schuster. Kendall, Lukas (1993): “Star Wars Trilogy: The Original Soundtrack Anthology. An Analysis by Lukas Kendall,” Star Wars Trilogy: The Original Soundtrack Anthology [4-CD box set with booklet], 20th Century Fox Film Scores, 07822-11012-2, unpaged. Lehman, Frank (2018): “The Themes of Star Wars: Catalogue and Commentary.” In John Williams. Music for Film, Television and the Concert Stage, edited by Emilio Audissino. Turnhout: Brepols. Lippincott, Charles (1977): Liner notes to Star Wars, 20th Century Records, 6641 679. Malone, Chris (2012): Recording the Star Wars Saga. A Musical Journey from Scoring Stage to DVD. Accessed 27-05-2018. Nielsen, Steen Kaargaard (2007): ‘“And incidentally, the score is quite beautiful” – Work conceptual reflections on the phonographic re-mediations of Max Steiner’s symphonic film score for Gone with the Wind (1939).’ Danish Yearbook of Musicology 35, p. 51-69. Rinzler, J.W. (2008): The Making of Star Wars. The Definitive Story Behind the Original Film. London: Ebury Press. Smith, Jeff (1998): The Sounds of Commerce. Marketing Popular Film Music. New York: Columbia University Press. George Lucas (1977/2006): Star Wars IV: A New Hope [including original 1977 version on bonus disc]. 20th Century Fox, F1-33919.1, 2 DVD. John Williams (1977): La Guerra de las Galaxias: Tema central. 20th Century Records, 02.1275/0, 45 RPM. John Williams (1977): La Guerre des Étoiles: Main Title. 20th Century Records, SG 651, 45 RPM. John Williams (1977): Guerre Stellari: Main Title. 20th Century Records, 6162 129, 45 RPM. John Williams (1977): Star Wars. 20th Century Records, 6641 679, 2 33 1/3 RPM. John Williams (1977): Star Wars: Cantina Band [US promotional copy]. 20th Century Records, TC-2345, 45 RPM. John Williams (1977): Star Wars: Cantina Band. 20th Century Records, TC-2345, 45 RPM. John Williams (1977): Star Wars: Main Title. 20th Century Records, BTC 2345, 45 RPM. John Williams (1977): Star Wars: Main Title. 20th Century Records, 6162 129, 45 RPM. John Williams (1977): Star Wars: Main Title. 20th Century Records, FMS-40, 45 RPM. John Williams (1977): Star Wars: Main Title. 20th Century Records. K-6841, 45 RPM. John Williams (1977): Star Wars: Main Title [US re-release]. 20th Century Records. TC-2345, 45 RPM. John Williams (1977/1978): Star Wars: Main Title and Cantina Band [2nd US re-release]. 20th Century-Fox Records, TC-2345, 45 RPM. John Williams (1977/1993): Star Wars Trilogy: The Original Soundtrack Anthology [box set with booklet]. 20th Century Fox Film Scores, 07822-11012-2, 4 CD. John Williams (1977/1997): Star Wars: A New Hope [special edition]. RCA Victor, 09026 68746-2, 2 CD. John Williams (1977/1997): Star Wars: A New Hope. RCA Victor, 09026 68772-2, 2 CD. John Williams (1977/1997): Star Wars: A New Hope Special Edition Soundtrack Sampler. RCA Victor, RCDJ-68795-2, CD. John Williams (1977/2016): Star Wars: Main Title [US promotional copy]. LucasFilm, FMG-77, 45 RPM. John Williams (1977/2017): Star Wars: A New Hope. Main Title [Record Story Day 2017 release]. Walt Disney Records, D002549111, 33 1/3 RPM. Steen Kaargaard Nielsen (b. 1964). Associate Professor at the School of Communication and Culture – Dramaturgy and Musicology, Aarhus University, Denmark. Specializes in various areas of 20th and 21st century music ranging from art music over film music to forays into popular music. Most subjects are linked by a prominent interest in phonographic music, both historical and contemporary, and the cultural practices involved in both its production and use. His phonomusicological publications include 'A change of scene: On the phonographic reconceptualization of the Broadway musical in the 1940s as reflected in commercial Kurt Weill cast recordings' (2005), 'Wife murder as child's game: Analytical reflections on Eminem's performative self-dramatization' (2007), ‘“And incidentally, the score is quite beautiful”: Work conceptual reflections on the phonographic re-mediations of Max Steiner’s symphonic film score for Gone with the Wind (1939) as soundtrack album’ (2008), 'Fra Oklahoma! til Beauty and the Beast: Original Broadway Cast-albummet som fonografisk genre I' (2010), 'En søndag i studiet med Goddard : Original Broadway Cast-albummet som fonografisk genre II' (2011), with Mads Krogh 'Spillover Censorship : The Globalization of US Corporate Music Self-Censorship' (2017), and 'The Cautionary Tale of Emil Holm and the Gramophone : Controversial(ised) Uses of Recorded Music and Music Recording in Danish Radio Broadcasting Before the Second World War' (2018). 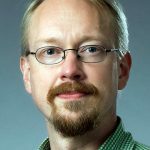 He recently co-authored a monograph on the earliest Danish sound recordings Danmarks første lydoptagelser – Edisons fonograf i 1890'ernes København (2017).